With over 15 years of experience as a staff nurse, along with recently earning her Bachelor of Science in Nursing (BSN), one thing might surprise you about Tiffany Breezee — she dropped out of high school. “When you’re younger and you think about what you’re going to do with your life, you don’t really expect to know how your future is going to pan out,” Tiffany said. In her eyes, Tiffany’s career journey is a convoluted tale. Frustrated with 70-hour work weeks at three different jobs, Tiffany was dissatisfied with her future outlook and knew she needed to change her path. At 18, Tiffany completed her high school equivalency diploma. Then, at 21 she pursued an associate’s degree in nursing at Wisconsin Indianhead Technical College (WITC). Having always been drawn to science and looking for a career that would both challenge and motivate her, Tiffany saw nursing as a new and proactive role in which to apply herself. Admittedly, Tiffany knew very little about what she was getting into — no one in her family had obtained a medical science profession degree before — but she was determined to at least try. Three years later, Tiffany graduated from WITC with an associate’s degree and passed the NCLEX exam. As a new registered nurse, Tiffany felt like she had made it. 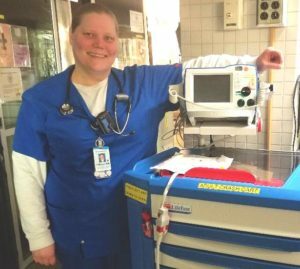 Next, she worked her way from registered nurse to assistant head nurse of the surgical intensive care unit (ICU) at Essentia Health in Duluth, MN. There, she influences decisions regarding unit improvements, speaks to the work of the nursing staff, and advocates for advancements in bedside care. However, once again, Tiffany knew she wanted to do more, and the next logical step was to obtain her BSN and reach her full potential as a nurse. Tiffany searched for a BSN degree from a university that had respect behind its name. Quality of education, flexibility with her work schedule, and affordability were at the top of her mind. After she enrolled in the University of Wisconsin Flexible Option RN to BSN online program, Tiffany knew she made the right choice. Powered by its career-focused education model, the UW Flexible Option online RN to BSN nursing curriculum is designed for working registered nurses like Tiffany. The program provides an affordable and flexible option for registered nurses to earn the BSN they need to move up in their current positions and to stay competitive in the ever-growing healthcare ecosystem. UW Flexible Option BSN students have the ability to learn when and where they choose. Progress is not limited by a traditional semester or term-based schedule, and students are allowed to take needed breaks throughout their studies. This flexibility suits the busy and varied schedules of working RNs, providing opportunities that allow them to advance their education while also focusing on their career. Through a self-paced curriculum, students focus on mastering competencies or skills by taking competency sets and passing assessments assigned to specific education areas such as leadership, communication, care management, and more. With this format, students are able to expand upon and apply their current knowledge and previous education. Upon graduation, students receive their BSN from the UW-Milwaukee College of Nursing, which is in the top 15 percent of U.S. nursing programs. Lisa Mihlbauer, a clinical associate professor and the director of RN-to-BSN completion programs at UW-Milwaukee College of Nursing has taught many students during more than 35 years at the university. When Tiffany was in her genetics and capstone competency sets, however, her work instantly stood out to Professor Mihlbauer. Throughout the rest of her competency sets, Tiffany’s work continued to impress and exceed expectations. Other faculty members in both nursing and health sciences contacted Professor Mihlbauer to praise Tiffany’s work when she completed exemplary assessments. Tiffany attributes her success in the UW Flexible Option RN to BSN online degree program to her work experience as an ICU nurse. 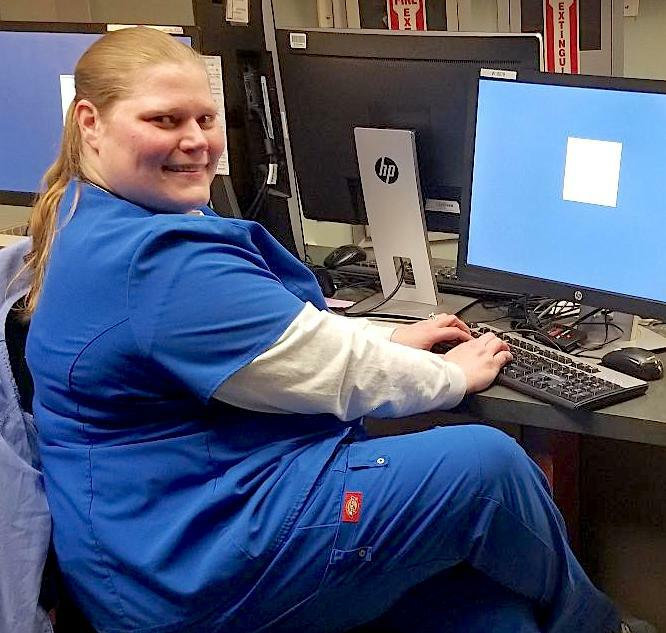 Prior to enrolling in the UW Flexible Option program, Tiffany found that many nursing roadblocks developed when she and her colleagues struggled to bridge the gaps among practice, research, and improved outcomes. Fortunately, the BSN program strengthened Tiffany’s leadership and communication skills, along with her action plan strategies to address such discrepancies. For example, Tiffany notes that the chronic care management and symptom management in chronic and life-limiting illness competency sets further enhanced her clinical skills. Lessons from these competency sets helped her better understand the barriers to health management and how to overcome obstacles by providing a more personalized approach to patient education and condition management outside of the structured hospital environment. For her capstone project, Tiffany drew on everything she learned in the online BSN program, and yielded positive results for the ICU at Essentia Health. Her team was dealing with a significant level of clostridium difficile (C.diff) bacteria infections among patients who were experiencing diarrhea, abdominal cramping, dehydration, and in more serious cases, inflammation of the colon. Tiffany saw her capstone project as an opportunity to contribute to her current patients’ health and decided to focus her capstone on decreasing the infection prevalence in her unit. First, Tiffany and the nursing staff used materials and lessons from her capstone to form a multidisciplinary team where she applied clinical practices she had learned to improve specific outcomes. Then, they identified increased risk factors for infection in their patients. She also used skills from her leadership and management competency sets to strategically plan and focus on staff development. Tiffany and the nursing staff’s main goal was focused on bedside nursing interventions that would lead to a significant risk reduction for their high-risk patient population, such as proper patient placement, preemptive isolation criteria, infection prevention education on the correct donning and doffing of personal protective equipment, standardized stocking processes to reduce cross contamination, effective hand washing, and more. Afterward, the multidisciplinary findings on potential lapses in environmental services and infection prevention departments were reviewed, and corresponding department managers facilitated improvements in terminal room cleaning processes, ancillary staff education, patient inclusion and exclusion criteria, and standardization for risk reduction in patient care areas. News of Tiffany and the nursing staff’s C. diff infection reduction success circulated, and they were recognized by Essentia Health’s CEO. Their work was also forwarded systemwide to improve other departments. As a recent graduate, Tiffany reflects on her time in the UW Flexible Option RN to BSN program, while also looking toward the future. Tiffany is committed to lifelong learning and has applied to a handful of doctorates of nursing practice (DNP) programs. She is excited to keep her options open as she figures out which of her many passions in patient care she wants to further establish. Joining cardiothoracic surgeons as a bedside nurse practitioner is one direction she is currently considering. For registered nurses who are considering a BSN program or newly BSN graduates like herself, Tiffany believes the best advice she can give them is to recognize their potential and to never stop trying to achieve it. The UW Flexible Option RN to BSN online program allowed Tiffany to pursue an education despite her busy nursing career, and she sees the same value for other working adults alike. Are you interested in earning your BSN? Call or email us today at 1-877-895-3276 or flex@uwex.edu to get started.